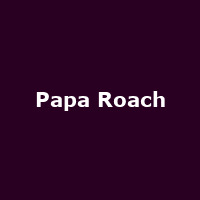 Just after their forthcoming 'Metamorphosis' album release, Papa Roach will embark on a short-but-sweet UK jaunt in April. The Californian alternative metal quartet hit the UK for their first UK headline tour (by our reckoning) for three years, from 16th - 18th April. The support act for the UK tour, which calls at Manchester's Academy on 16th April, London's Forum on 17th April and Birmingham's O2 Academy on 18th April, will be industrial rockers Filter, from LA. Filter were due to support P.O.D on their UK tour over the next week-and-a-bit, but that tour was cancelled. 'Metamorphosis', the band's fifth studio album, produced by Jay Baumgardner will be released on 24th March on Geffen records. Tickets cost £17.50 for the London date and £16 for the other two dates and go on sale on Weds 4th February at 9AM.